Basement Condition | Listen Free on Castbox. Welcome to Basement Condition! A nerdy kind of podcast that covers everything from movies, TV shows, comics and video games in the form of news, Top 5s, reviews and other nerdy shenanigans. Won't you join us? It's time for a new episode! This week we talk the latest News Nuggets and get into some deep discussions about the new Slaughterhouse Rulez trailer and the latest Doom Eternal gameplay. Tune in and stay mint! Welcome to our first ever Retro Game Night episode! On this episode we are playing and reviewing 2001's Tony Halk's Pro Skater 3 while at the same time still talking about the latest News Nuggets, Movie Trailers and all the nerdy shenanigans you've grown to love. We have been a way for a little while so we have some catching up to do... Aquaman, Shazam and Godzilla 2 trailers plus much more. Just tune in and hear for yourself and as always... stay mint!! It's time for episode 150 folks! And on this episode, Ally pays tribute to Leon Allen White aka Big Van Vader, we talk Shane returning to the Walking Dead, more Joker Origin Film rumors, Jason Todd on Titans TV show and more before moving onto part 2 of our review of Netflix's Evil Genius. Then to wrap it all up in a nice little package, Versus Mode Returns! So hear it, enjoy it and as always, stay mint! Ep.150 - Evil Genius Pt.2 / Versus Mode Returns! It's that time of year people! E3 2018 Video Game Mega Epic Extravaganza episode! Well... it's pretty epic... maybe. But we kick things off with some News Nuggets before talking about some E3 trailers, what we're looking forward, what get's us excited and to mix things up a little bit we celebrate Jurassic Park turning 25 years old this. 25 years old!! So sit back, take a little listen and stay mint! We are at it again and this week we get to hear about how much Brandon loves naps! We also talk about some News Nuggets like Stranger Things retro cards, Top Gun sequel news, a possible Roseanne spinoff and more. Then we review episode one of the new Netflix show Evil Genius before finishing it all of with Brandon challenging Ally to a Movie Quote Challenge!! We more than likely go off on a random tangent here and there but that's half the fun so listen, enjoy and stay mint!! Ep.148 - Evil Genius/Movie Quote Challenge! It finally happened! Ally has finally seen Edgar Wrights Baby Driver! So of course that's what we review on this episodes Spotlight Review. But before that we go over some pretty sweet News Nuggets in the world of nerd and as our 3rd act of the show we answer questions sent in by listeners like you! If you have any questions for us for future episodes you are always welcome to get in touch and get a shout out on the show. Enjoy it and stay mint nerds!! 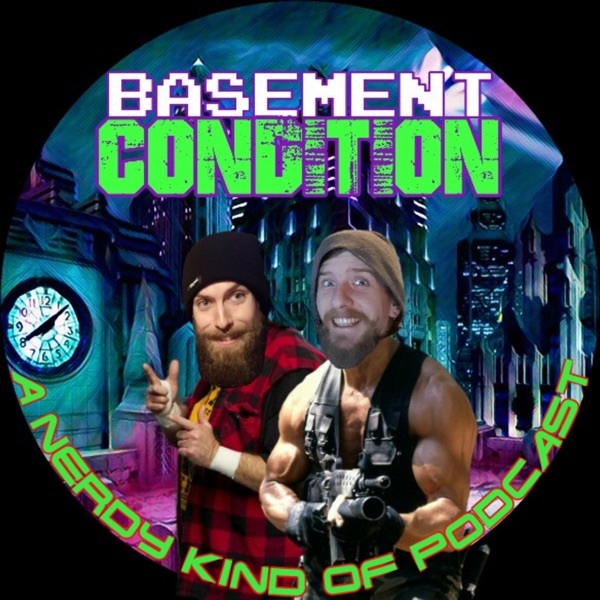 It is time for another episode of the Basement Condition podcast! And on this week's episode News Nugget's include Jake Gyllenhaal in talks in talks to be in Spider-Man Homecoming sequel, Gotham Season 5 to adapt Zero Year comic, the next Arrowverse crossover and trailers for the week include Mogley and 4 C.O.D Black Ops 4 trailers (3 being ZOMBIES!) Then we stray away from the theme of the episode (which turned out to be zombies, unintentionally) and shine our Spotlight Review on Marvel's Black Panther. To finish things off we go over our Top 5 Zombie Video Games, which we may have already done (,ore than likely) but that's ok because Basement Condition will be rebooting in the near future and starting once again at episode 1 so just go with it, cool? And as always, stay mint!! On this week's episode New Nuggets include What TV shows have been renewed or cancelled, DC Universe (the streaming service) updates, a possible Bobby's World revival and a new Predator comic cook! Speaking of Predator, we finally got to see a trailer for Shane Black's The Predator, which we talk about, as well as DC's new animated feature, The Death of Superman and the trailer for Rage 2 (it's a video game) And since we already talked about Predator quite a bit, we go ahead and review the movie that started it all for our Spotlight Review, Predator starring Arnold Schwarzenegger. Then to wrap it all up we play another round of our famous game (not really though) Synopsis Conundrum! This week we actual do have a winner as our friend Randy Pardy came on the show and judged our answers! Was his judgement fair? You be the judge! This week on the show News Nuggets include Rambo 5, John Lithgow cast in Pet Sematary remake, a Pick of Destiny sequel and a 3rd Bill and Ted film! Only one trailer this week and that is the new Robin Hood movie coming out this year. Then we move onto our Spotlight Review of the week which shines on Phase 3 of the MCU (so far) and we wrap everything up with a brand new segment that we have dubbed... VERSUS MODE! So tune in, hear some sweet nerdy ramblings and see if we can pull of a new segment while still sounding cool. And as always, stay mint!! Ep.144 - MCU Phase 3/Versus Mode! What do you get when you put 2 sleepy podcasters in front of a mic and hit record? You get episode 143 of Basement Condition! Where News Nuggets include Westworld season 3, Zeitgeist in Deadpool 2, Updates on TWO future Star Trek films, Ryan Reynolds' thoughts on Deadpool 3 and Bruce Campbell retires from playing another beloved character from his movies (and breaks Brandon's heart even more) Trailers that we talk about include Ant-Man and the Wasp, Kin and the newest trailer for Red Dead Redemption 2. The spotlight review this week shines on the underrated cult film, Grandma's Boy and we finish it all off by answer some questions sent in by you, the listener! (maybe not you, but that guy over there...) So treat your ear holes to the sweet sounds of episode 143 and as always, stay mint!